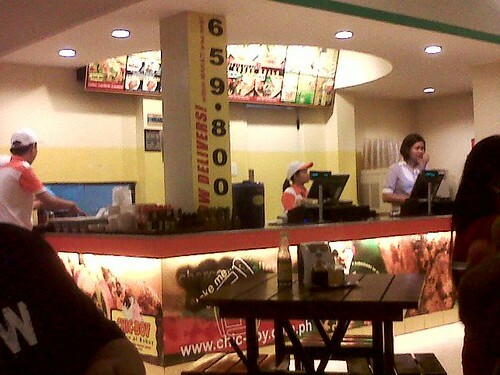 They have meals that offers unlimited rice. Surprisingly, I only ate one cup which is unusual. Asked my friends and colleagues and they will tell you how I love rice and bread. Anyways, I guess it has something to do with my hip hop abs exercise which makes me eat less due to the crunches and "working out the core". I'm still trying my very best to exercise 3-4 times a week every 30 minutes. We got a visitor in the office. She's cute, small and quiet. You will thought at first glance that she's a stuff toy but when she starts blinking her eyes, that's the time that you will realize that she's a live dog =P Well I'm saying these words based on my reaction...hehehe. She is one toy poodle that has manners. She is behave and well trained. You wouldn't know that there's a dog in the office because she doesn't make any sounds at all. 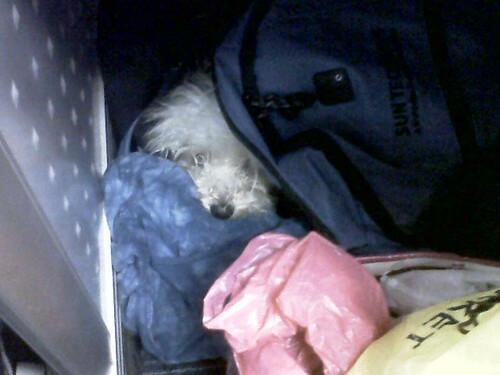 She's contented sleeping in a backpack of her owner. I wish I have one just like her but that might be a problem since all of us are working here at home and nobody will look after her. We have one dog already who is so loud when she barks. Well, I'll just create a different post about Poochie. I almost forgot that I have these accessories. 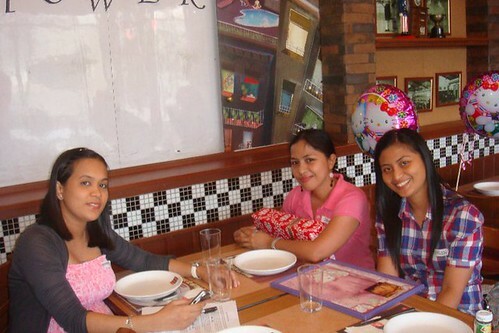 It is part of the Christmas gift for me from Ate Sally (we've been friends since 2001 but we rarely see each other. The only time that we see each other is every December (Xmas)). 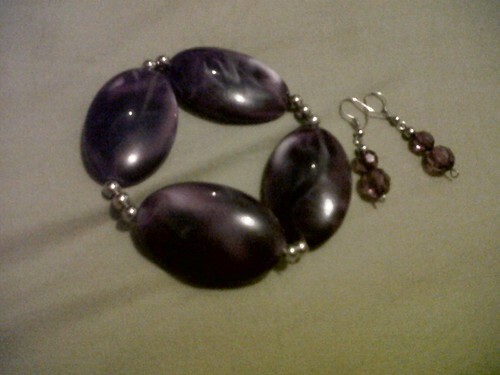 Apart from these accessories she also gave me a black blouse which I used twice already. I haven't had a chance to use the bracelet and earrings yet but hopefully I will this coming March when it's summer here in Manila! I'm excited for our first family outing which will be in Splash Island. I've never been there and it will be my first time. Same goes for my sisters and brother. The husband will not join us. Boohoo! KJ! I made a switch! From being an Accor Hotel member (Sofitel), I am now a proud member of Hyatt Hotel. What made me decide to change? 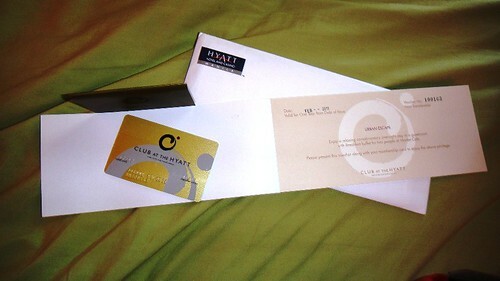 Well for starter, the Hyatt membership offers a lot of certificates compared to Sofitel. Apart from that, I'd say that it's easy to commute going to Hyatt compared to Sofitel. As an added benefit, they offer a 20% discount on beverage at all participating restaurants and bars at Hyatt Hotel and Casino Manila. Club Oasis offers a 15% discount on Gold and Silver Annual Membership at Club Oasis including 15% discount on select services at Spa at Club Oasis. Offer is subject to availability and is exclusively for member's own usage. Hyatt Hotel and Casino Manila offers 15% discount on all room types (maximum of 2 rooms) booked under the Best Available Rate. Offer is subject to availability and prior reservations are required. Club at the Hyatt members are entitled to special room rates at participating hotels and resorts worldwide. * These are the only vouchers that I can remember but I know that there are like 10 vouchers/ certificates when I received my membership kit. I'm going to check the list to give the complete package of their membership. 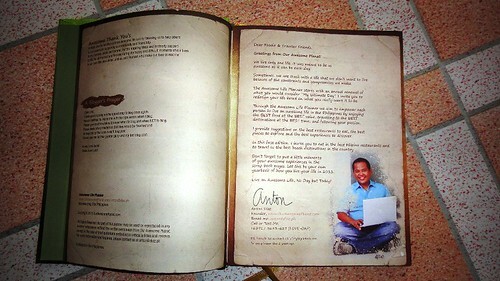 They only have 1,000 copies of this planner and I'm proud to say that I'm included on the first batch to received this. I can't wait to use it and of course plan my next travel trip. Hopefully I can share this travel experience with hubby as he is a certified party pooper when it comes to this kind of activity/ leisure. I'm not sure if I mentioned this planner on this blog but the makers of this planner are the ones behind the BDJ which I owned for the past 2 years until I discovered this and decided to give it a try. The downside of this planner is they don't offer or it has no discount coupons unlike the BDJ. In return, Anton gave his suggestions on what best restaurants to eat, best places to explore and best experiences to discover that includes the best beaches in the country. I can't wait to check out those places in the next coming years! 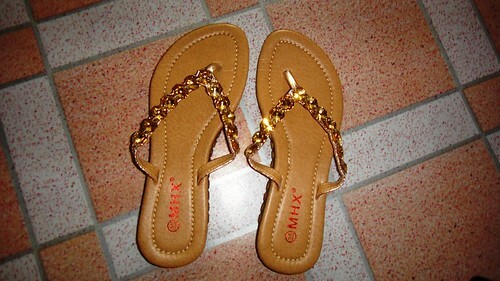 I received this pair of sandals as a "pasalubong" from my hubby's aunt. She's like a "kabarkada" and I can say that she's a cool mom to her kids but firm as well. I didn't expect she will give me a gift and it was really sweet of her to think of me when they went for a vacation in HK. Thank you! I haven't used it yet though but on March I will. Uh-oh! See the dark clouds in the horizon? If my memory serves me right, it actually did rain but not a heavy rain. 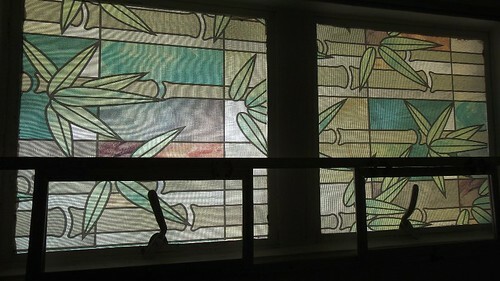 My sister and I bought it for Php 350 per meter. Step 2 is finding the right color of paint for the walls or I may seek the services of an interior designer to dress up our 3rd floor. But before I jump completely into that idea, I will need to save up and budget our expenses. - Update my backlog photos for Project 365. - Forget work and the burden that comes with it. - Have a "social life" and time to mingle with friends and family. - Sleep for 8 hours or more! 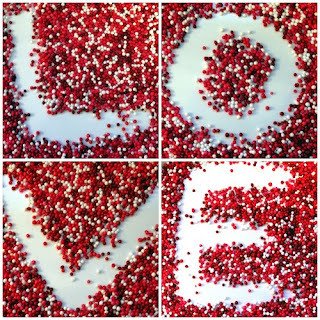 - Celebrate hubby's birthday! Yey! These are the things that keep me sane from all the "pressure" that I got from working on weekdays in a night shift. Two more days left. P.S. I know I have a backlog (again) of my Project 365 photos. I'm looking for the battery of my sister's digicam in order for me to transfer the photos to my laptop and upload it in Flickr. I apologize for that. Promise, I'll update everything this week. Don't want to wait for March to come before I can finish my February photos. 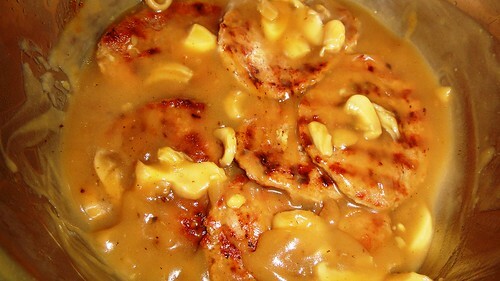 Thank you electric grill for cooking the burger patties; canned mushrooms and powder mushroom gravy sauce that I need to dissolved and mixed in a boiling water. Next on my list, sweet and sour chicken nuggets :) So far, I haven't prepared that viand as I am busy when it's weekdays. Sigh! I wish I can go back to working on dayshift with a good pay. My youngest sister and hubby's niece troop down to the nearest mall in our area to watch the dog show. I gave them this tip when I went there to buy dog food for our pet. As soon as I gave them the permission to watch, both were static and hurriedly dress up! Kids are always happy when they are outside. I even lend them the digital camera of my other sister so they can take pictures of the various breed of dogs waiting to strut their stuff. Speaking of my sister who owns the camera, she is wishfully thinking of having a Siberian Husky for a pet. Ha! I find them high maintenance because it's a known fact that they need to stay in a place where it's cold unlike some other dogs that can live whatever kind of weather it may be. I saw this lucky keychain charm in Francesca's Charms Crystal's in FB. She is selling Fengshui items similar to Lilian Too of World of Fengshui collections. I was thinking of buying this keychain and the Bronze Arwana that I will be displaying in our home for luck. Affirmations have the power to transform your life! 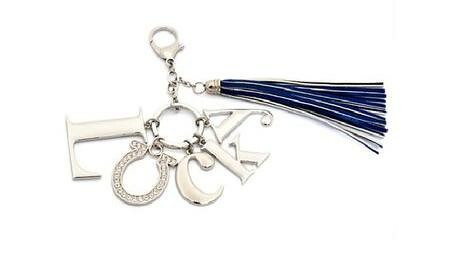 Bring luck on your side with this auspicious key chain that features the word LUCKY. Made in chrome silver and embedded with brilliant zirconia crystals, carrying this beautiful accessory attracts good luck into your life. The U in the word "lucky" has been designed as a horseshoe, thus providing you with protection against harm as well. The classy faux leather tassel is made in blue to capture the essence of water, to give you a boost in wealth and career luck. Clip it on your handbags or laptop bags, and bring fortune with you everywhere you go. 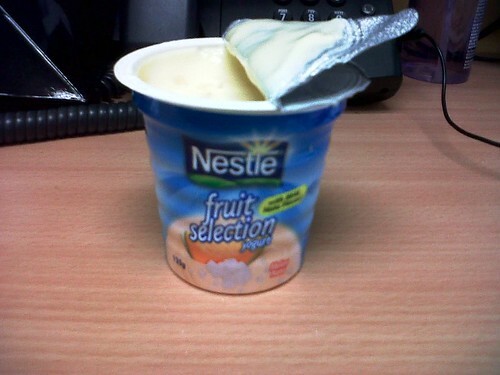 I just tried this new flavor from Nestle Fruit Selection Yogurt. It has jellies so despite that it's a little sour, I still find it yummy. It's melon flavor. So, my only resort to stay healthy is to minimize junk foods and to exercise regularly if possible. 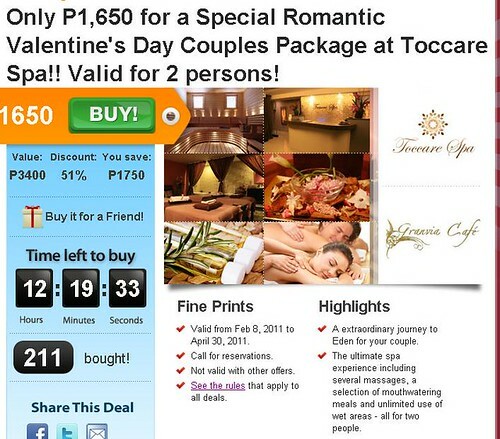 If I'm not mistaken, this will be the 2nd or 3rd time that me and the husband will be celebrating Valentine's Day. We don't normally celebrate it like the rest of the couples out there. My very own fitness trainer in the comfort of our home!...hehehehe. This was my lunch for the day. It's a cheesy mushroom pie from Banapple. I never thought it will taste so good sans the meat. Love it! 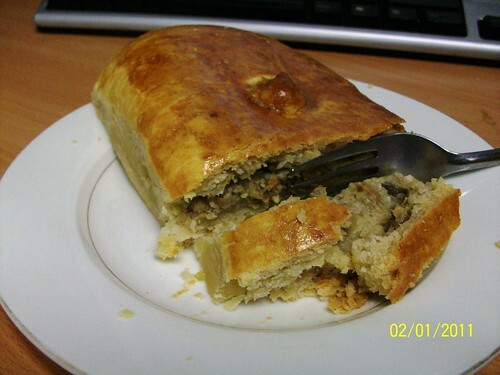 I haven't tried the tuna pie but I so heart Banapple's chicken pie ;) I will make sure to buy some for the husband as he is starting his Java training in February. He needs good food to have his mind working, right? 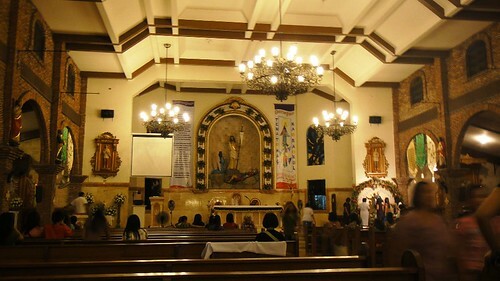 Oieydie and I attended the christening of Peyton, the cute daughter of Aisah (our friend and former officemate). I'm late with our meet-up so we decided to go straight to the reception venue and skip the church. 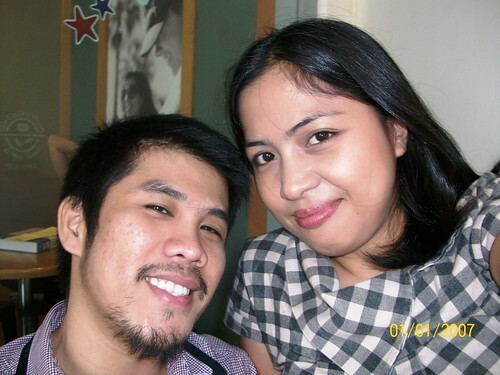 My sister and I attended Aira's baby shower. She will give birth in March 20 so at present, she's 7 months on the way. She will soon have her "mini-me". I was looking lovingly on this picture and having a debate in my mind if I should get it or not. Well the "bagaholic" inside me can't resist this temptation so I gave in! I already made the reservation fee and according to the seller, the goods will arrive in February. Oh I can't wait to see this bag in person. As usual, Kristine is simply beautiful...and Oyo is one heck of a lucky guy!